Before we reveal the bars from the February 2016 box, we’d like to mention that we have a very exciting change coming in the March box! Look out for it! This bar is a combination of opposing flavors…plus some fantastic dark chocolate, of course! Hope you didn’t get too crazy with trying to guess the flavors since you’ll soon see that they’re two of the most common flavorings out there! These guys like hiking in the wilderness (as you can see by the wrapper) and making awesome chocolate. 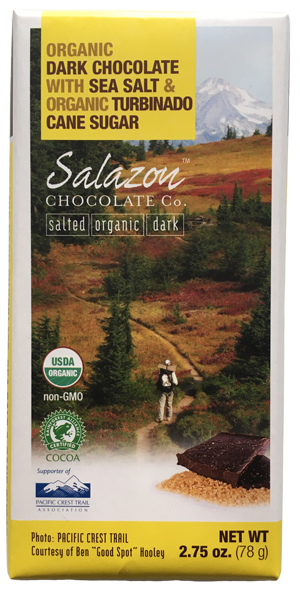 (They actually came up with the idea for salted chocolate while backpacking in Utah). This bar had a slightly different flavor than anything else we’ve tasted — it’s very rich, but the two different inclusions are blended perfectly with the chocolate. Nothing is too overpowering, and the flavors are surprisingly complementary. A highly decorated chocolate maker out of Utah (you should see their awards page), Amano has clearly mastered blended inclusion chocolate bars…this one being a prime example! We love how they work directly with their cacao growers and have built their company around one single mission: making the best chocolate possible. This is honestly one of the more addictive chocolate bars we’ve tasted. Take one bite of this bar and you’ll immediately get a taste of fantastic, smooth milk chocolate, and then a flavor that I would describe as “fresh” or maybe “clean” blends into the milk chocolate. Then, there’s a tiny bit of a kick to it, although it’s not spicy… interesting indeed! So here’s the scoop on Milkboy…they’re named after the Swiss milkboys who tend to cows grazing on the Swiss Alpine meadows, which means they produce some of the world best milk. 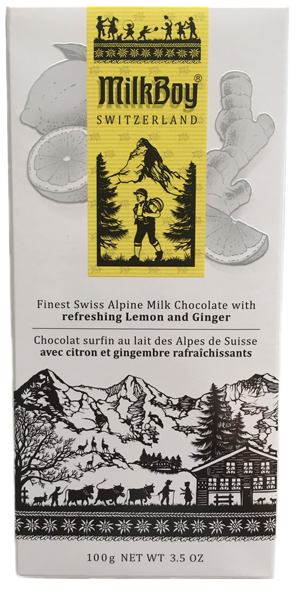 Take the best milk and combine that with top-notch chocolate and you get the recipe for some amazing milk chocolate…which you tasted in this bar. Definitely one of our favorite milk chocolate bars! So that rounds out this month’s bars…which did you like the best? Until next month….again we have a very exciting change starting next month, so look out for it! No Replies to "February 2016"